For this to work you have to sing this part in your head to the tune of the Twelve Days of Christmas. 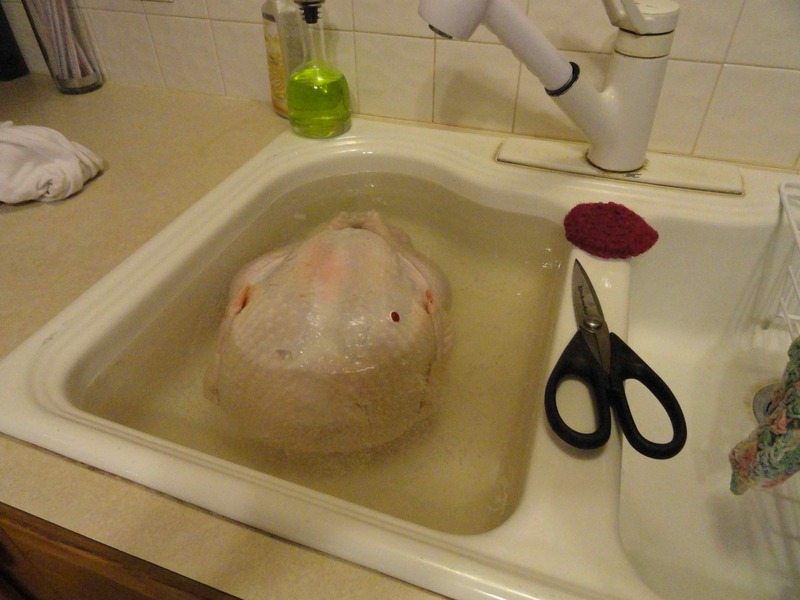 You have thawed the turkey in the fridge for 3 days and when you get the roasting pan ready, the stupid bird is still frozen. Yeah, that should have been my first clue that the night would not go as planned. We’ll bake pie instead at Martha’s house while Tom takes a little swim in the sink. Two martinis into the 5, yes 5 pies that were rolled and filled and baked there was a knock on the door. 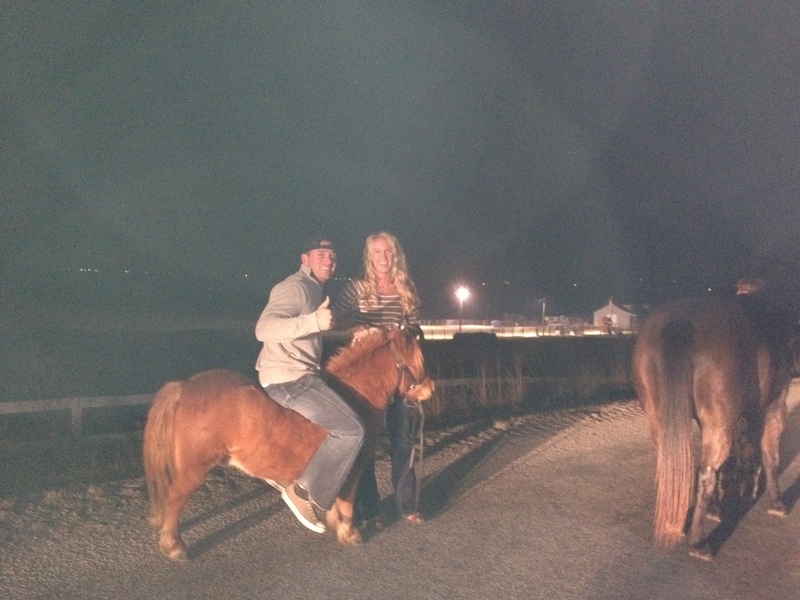 Ma’am, I think 3 of your horses and a pony got loose. They are headed south on the road. Hmmm, not our horses, but we know who owns a pony in the neighborhood. It’s also pitch black outside. We have no street lights out here either. Calls were made, spotlights & harness were quickly found, ATVs were fired up and the search party was mobile. Do you know how difficult it is to find black and brown horses in the dark? Horses that are no longer on the road? I’ll spare you the blow-by-blow details, but the needless to say they were all eventually found, harnessed and lead back to their home. 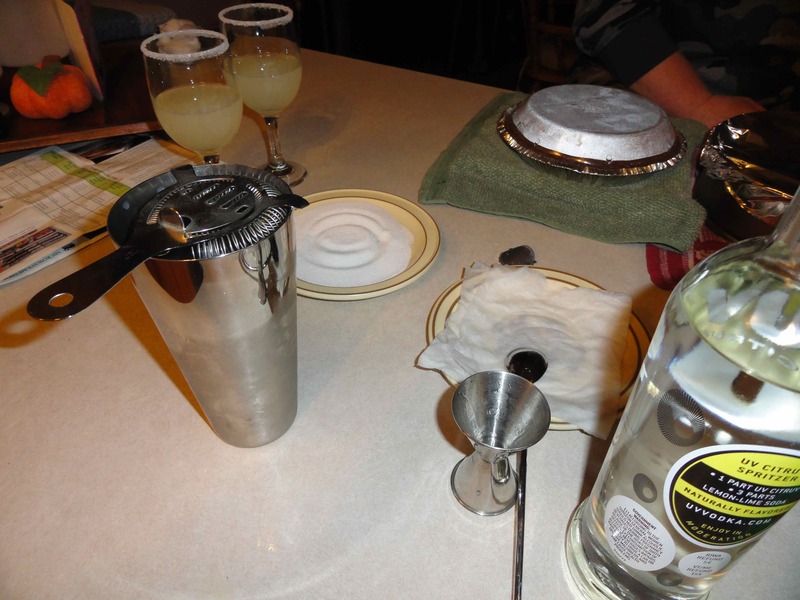 Since the pies are done at this point, maybe one more drinkypoo because lemondrop martinis rock. Tom seems thawed enough for dressing and has been trussed and seasoned (like this). At this point we are still laughing about the Great Thanksgiving Horse Escape and the fact that a grown man has ridden Pineapple the pony all the way back home. Like we weren’t gonna stop for THAT photo op. At this point we’re back at my house, giggling and finishing up the logistics of the table leaf and the good china and the serving platters and the phone rings. 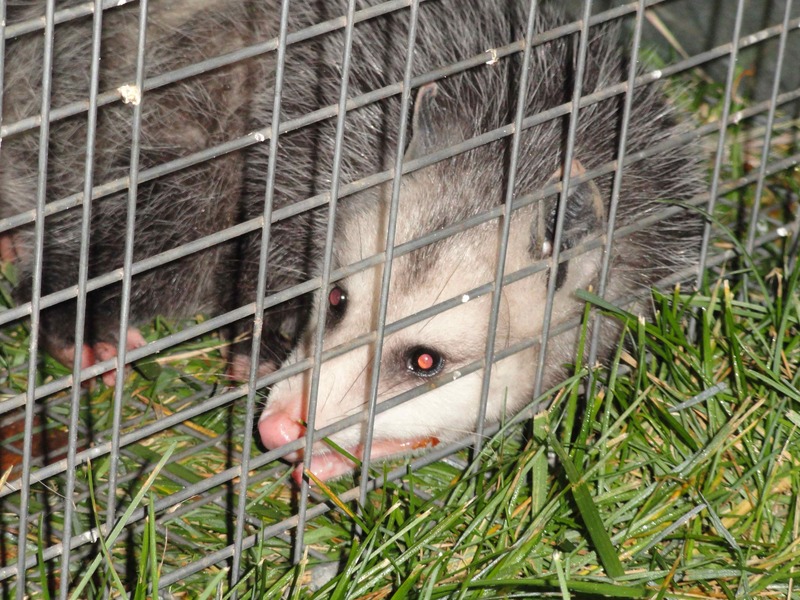 It’s Martha’s husband, There was an opossum in the barn terrorizing the cats and it’s in a live trap now. What do you think we should do with it? Hmmmm….we could drop it off at an unpleasant guy’s house in town…maybe we shouldn’t drive at this point….and we could probably get arrested…but we REALLY wanted to drop it off at his house…. We asked our designated driver who said, yeah sure ~ you just keep brainstorming that one ladies. In the end, we decided to let him free in the woods and tell my son that he would really like the new kind of ham we were serving with Thanksgiving dinner. He didn’t buy it, but it made for fun conversation at our Thanksgiving dinner. And everything turned out just lovely! haha Awesome! So, this year, you’re very thankful for martinis, right? Yours was much more eventful than our mouse in a trap and bat in the house. Yep, and thankfully the rest of the holiday went much better. I have been enjoying your posts too about the new house. Unwanted guests like you have had are always an adventure 🙂 And I love the new rug you are working on too! Happy Holidays! Tat possum looks adorable tho! 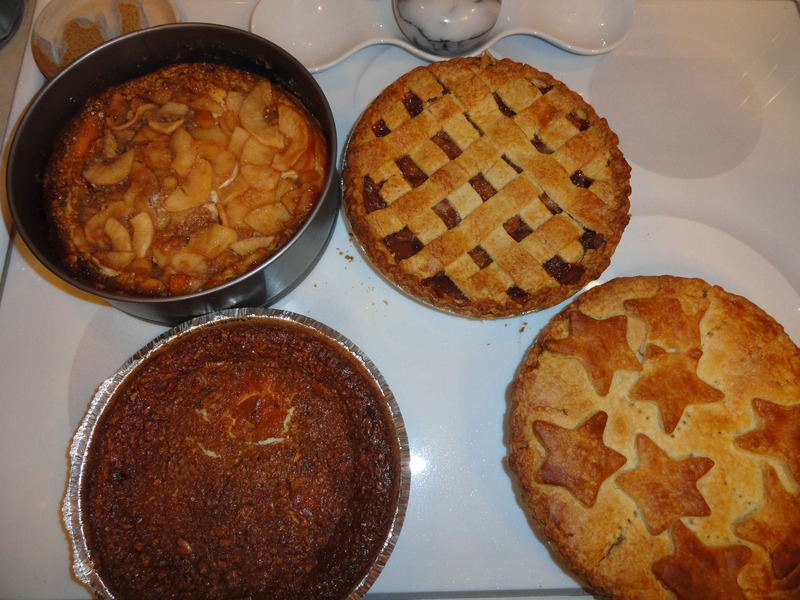 And those pies look delicious, we don’t have turkey day here, but all those pies made me wish we did.